Is it SMART to reward Excellence? 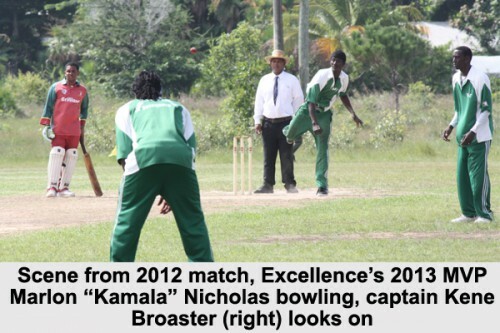 Whatever were the problems of the previous cricket executive, there was a new President at the start of the 2013 SMART Harrison Parks National Cricket Competition, and the new sponsors, SMART would provide the finances needed to secure the prizes for this year’s competition. No money is collected from fans at cricket games, because the fields are not fenced, and there was no corporate sponsor for the 2012 season. Last year’s committee, headed by Lewellyn Sutherland after the resignation of Elston Wade, had originally postponed the traditional “Trophy Day” due to then approaching tropical storm Ernesto; but time went by, and the 2013 season began without Excellence receiving their championship trophies for the 2012 season which ended on August 4, 2012. With the final best-of-3 games series for the 2013 championship approaching, Excellence captain Kene Broaster and veteran player Sylbert Martinez voiced their opinion that the managing committee of cricket was duty bound to see that Excellence receive their 2012 trophies; and we concurred. We called the current cricket President, Leroy Banner, who maintained that SMART was not the sponsor of last year’s competition. We told him that the Excellence team is very unhappy, and justifiably so, and we will make their concerns known to the public; because, whoever is currently in charge of the association bears the responsibility of the association’s obligations. Mr. Banner called us back a half hour later to assure us that the sponsors “have promised to also provide the trophies for both last year’s and this year’s competition.” We therefore printed a story titled “Trophy problem solved..” in our issue for Wednesday, July 3. But apparently that is not the case. Unfortunately, on Tuesday of last week, when we congratulated Excellence captain Kene Broaster on his team’s victory, he informed us that they had only received trophies for the 2013 championship immediately after the final match on Saturday, July13; nothing yet for 2012. Repeated attempts last week and up to today, Wednesday, July 24, to reach cricket President Leroy Banner by phone have been fruitless. We maintain that it is the obligation of the managing committee of cricket, whoever is in charge, to see that the champions of 2012 receive their trophies. SMART is the sponsor of the 2013 SMART Harrison Parks National Cricket Competition; and they have already delivered the trophies after the 2013 championship final game to this year’s winners, back-to-back champions Excellence of Double Head Cabbage. The Belize National Cricket Association (BNCA) formed a partnership with SMART earlier this year; but it is not clear if SMART was at the time aware of the BNCA’s outstanding obligations. The facts are that (1) SMART only took over the sponsorship of cricket this year, 2013; but (2) cricket owes important trophies to the 2012 champions. The questions we would like you the fans to answer: (1) Is it SMART who should now also provide the trophies owed for the 2012 season? And (2) if not SMART, then who?